﻿﻿﻿﻿If it wasn’t the drought, it was the heat. If it wasn’t the heat, it was wildfires. Texas has suffered through a brutal year of severe weather and destructive blazes. ﻿﻿﻿﻿﻿All summer long and into the fall, the weather records toppled like so many flaming trees. Except for an occasional taunting sprinkle, it seemed as if Mother Nature had forgotten how to make rain as Texas baked in what climatologists labeled an “exceptional” drought. Meteorologists characterized the drought as the worst one-year dry spell Texas has seen since records began to be kept in 1895 and pointed to the grim prospect of a continuing dearth of precipitation for the foreseeable future. It was the state’s hottest summer ever. On top of that, for a time it seemed as if the whole state was on fire. As of mid-fall, the Texas Forest Service reported that a staggering 25,865 wildfires had blackened 3.8 million acres and destroyed 2,876 homes since November 2010. The worst fire broke out in Bastrop County on Sept. 4, a hot, dry, windy Sunday afternoon. Before firefighters got it contained, the Bastrop County Complex Fire covered some 34,000 acres, claimed two lives and destroyed more than 1,600 homes. 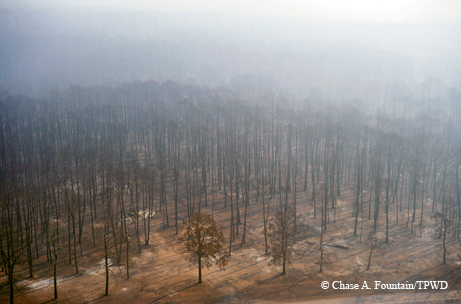 Not only that, the fire burned an estimated 1.5 million loblolly pines, part of the unique Lost Pines ecosystem. 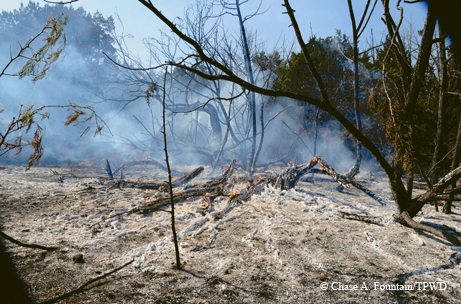 The fire swept over 95 percent of Bastrop State Park, charring many of its trees and destroying much of the habitat critical to the survival of the endangered Houston toad. But as philosophers have sung for millennia, and Michel de Montaigne distilled to only five words in 1580, “All things have their season.” Sooner or later, it will rain again in Texas. ﻿When a wildfire broke out in Bastrop County on Labor Day weekend, billowing black and gray smoke could be seen 30 miles away in Austin. 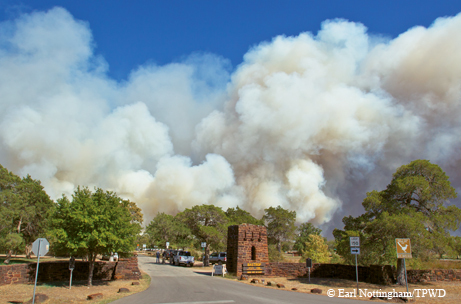 Smoke filled the sky over the iconic Depression-era red sandstone entrance to Bastrop State Park (photo below). 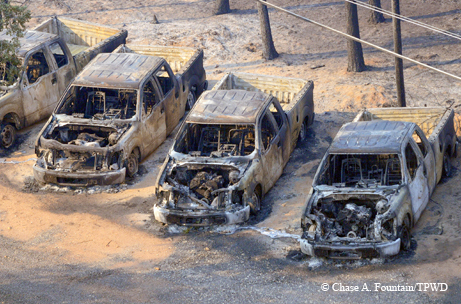 The raging fire exploded towering loblolly pines like so many giant green matchsticks (middle photo below). Pushed by near-gale-force winds, the fire heavily damaged TPWD’s regional state park headquarters, destroying several brand-new state vehicles (third photo). 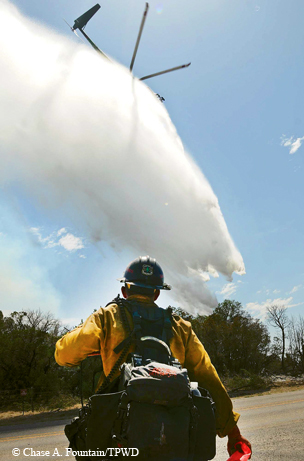 TPWD firefighters and volunteers, with water-spraying trucks from the Texas Department of Transportation and heavy equipment loaned by various private companies, battled the fire for more than two days to save the park’s historic Civilian Conservation Corps-built structures. Only the roofs of two scenic overviews constructed in the mid-1930s were lost to the fire. 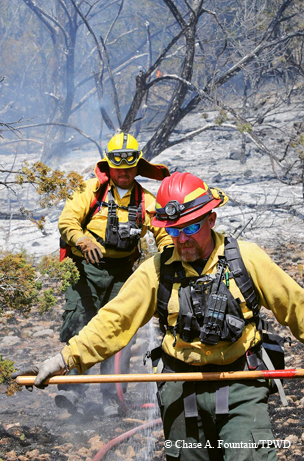 For more than a week, firefighters and park staff continued to extinguish hot spots and reduce fuel load in the park. 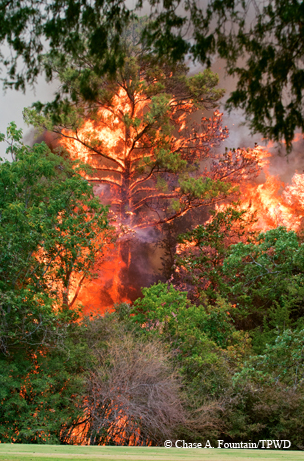 ﻿Months before the Labor Day weekend fire in Bastrop County, TPWD firefighters and other personnel tangled with a monstrous wildfire in Palo Pinto County (photos below). That fire, in April, swept into Possum Kingdom State Park, burning all but roughly 200 of the lakeside park’s 1,528 acres. Most of the structures at the park escaped damage. Firefighters’ efforts also succeeded in protecting the Possum Kingdom Fish Hatchery. The Possum Kingdom Complex fires scorched almost 127,000 acres and consumed 167 homes. On a brighter note, park officials say the fire’s long-term impact on the park’s ecological health will be positive because the blaze removed much of the dense covering of invasive mountain juniper (cedar) that crowded out native vegetation. As native grasses, wildflowers and fire-adapted shrubs and trees grow back, the park will support a greater diversity of plant and animal life than before. Also in April, fires in the Davis Mountains area of West Texas burned more than 300,000 acres in one of the largest blazes in Texas history. The fire burned 675 acres of Davis Mountains State Park. Throughout the summer and into fall, many Texas lakes seemed to be draining as fast as a bathtub. 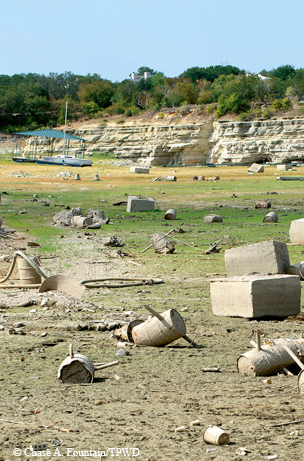 In Central Texas, where these aerial photos were taken in early September, Lake Travis dwindled to its lowest point since 1964, down more than 52 feet from its full level. 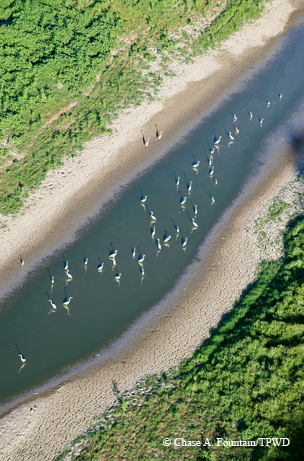 In the first photo below, shorebirds crowd what little water remains in the Pedernales River portion of Lake Travis. In the following photos, floating docks along parts of the lake have nothing to float on. ﻿Some impoundments, such as Lake Meredith in the Panhandle and Lake E.V. 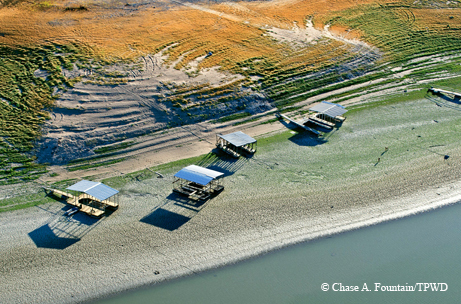 Spence in West Texas, became bone dry or nearly empty as the year went on. In the photo below, the dam and spillway at O.C. 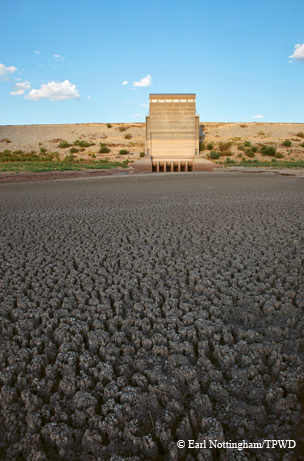 Fisher Reservoir near San Angelo had almost no water to contain by summer’s end. As the lake disappeared, its remaining water turned blood-red from Chromatiaceae, a type of bacteria that thrives in oxygen-starved water. 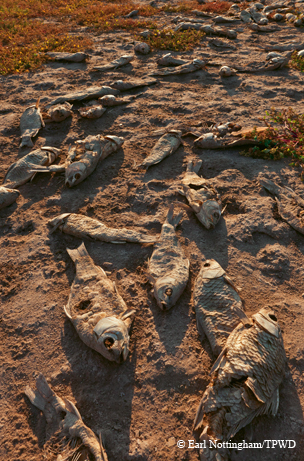 Also below, fish left high and dry slowly decompose in the merciless West Texas sun.